Miriam's Well is vocalist Mir German and her co-writer, guitarist and producer Mark Bowden from Portland, Oregon. 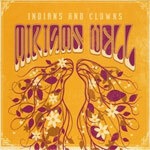 If you dig Sheryl Crow mixed with a less drug infested Janis Joplin, then Miriam's Well's debut Indians and Clowns might be up your alley. But that only speaks to Ms. German's vocal style. While German is certainly at the forefront, Miriam's Well delivers a substantial rock vibe to the underlying blues. Indians and Clowns, War No More, and Waiting on a Plane have an edge, between volatile and gritty, to their substance. Beyond, Ms. German's vocals, strong songwriting is the strength of Indians and Clowns. After that it's the sound song composition. There's plenty of diversity here; thanks to Mr. Bowden's influence, I would guess. Production and mix are also sound and nearly extravagant. Supporting musicians are like the proverbial frosting on the cake. For an independent production, Indians and Clowns doesn't get much better than this. Nevertheless, as mentioned earlier, vocalist Mir German is the focus here. Your decision and appreciation of Miriam's Well will rise or fall upon her performance; it's that simple. Honestly, I liked her, but I can't say that she sufficiently charmed me. But when I listen to her sultry blues vocals and that tenor saxophone (I'm a sucker for sax), I'm undone. And I'm guessing she's probably quite attractive too. But that would never influence my commentary. Recommended. Your decision and appreciation of Miriam's Well will rise or fall upon her performance; it's that simple. Honestly, I liked her, but I can't say that she sufficiently charmed me. But when I listen to her sultry blues vocals and that tenor saxophone (I'm a sucker for sax), I'm undone.